Texas Stadium was an American football stadium located in Irving, Texas, a suburb west of Dallas. Opened in October 1971, it was known for its distinctive "hole in the roof", after plans to construct a retractable roof were abandoned. The stadium was the home field of the NFL's Dallas Cowboys for 38 seasons, through 2008, and had a seating capacity of 65,675. In 2009, the Cowboys moved to the $1.15 billion AT&T Stadium in Arlington. Texas Stadium was demolished on April 11, 2010 by a controlled implosion. The Cowboys had played at the Cotton Bowl in Dallas since their inception in 1960. However, by the mid-1960s, founding owner Clint Murchison, Jr. felt that the Fair Park area of the city had become unsafe and downtrodden, and did not want his season ticket holders to be forced to go through it. Murchison was denied a request by mayor Erik Jonsson to build a new stadium in downtown Dallas as part of a municipal bond package. Murchison envisioned a new stadium with sky boxes and one in which attendees would have to pay a personal seat license as a prerequisite to purchasing season tickets. With two games left for the Cowboys to play in the 1967 season, Murchison and Cowboys general manager Tex Schramm announced a plan to build a new stadium in the northwest suburb of Irving. Texas Stadium, along with Arrowhead Stadium (1972), Rich Stadium (1973), and the Pontiac Silverdome (1975), were part of a new wave of football-only stadiums (all with artificial turf) built after the AFL–NFL merger. More so than its contemporaries, Texas Stadium featured a proliferation of luxury boxes, which provided the team with a large new income source exempt from league revenue sharing. It hosted its first game on October 24, 1971, a 44–21 victory over the New England Patriots, and became an icon of the Cowboys with their rise in national prominence. The Cowboys entered the season as defending NFC champions and won their first world title in Super Bowl VI in January 1972. The field was surrounded by a blue wall emblazoned with white stars, a design replicated in its successor, AT&T Stadium. Texas Stadium's field alignment (between the goal posts) was southwest-to-northeast, perpendicular to the Cotton Bowl, which is southeast-to-northwest. The most distinctive element of Texas Stadium was its partial roof, the only one in the NFL. The roof was originally supposed to be the first retractable roof in the NFL. However, it was discovered that the structure could not support the additional weight. This resulted in most of the stands being enclosed but not the playing field itself. This design prompted Cowboys linebacker D. D. Lewis to make his now-famous (and much paraphrased) quip "Texas Stadium has a hole in its roof so God can watch His favorite team play." This meant that weather could become a factor in games, perhaps most famously in the Thanksgiving Day game against the Miami Dolphins in 1993, which saw the field covered with snow. This unusual arrangement also made it difficult to televise games, a problem, generally speaking, foreseen by the original architect  as sunlight would cover part of the field and make it hard for the cameras to adjust for the changes in light. The roof at Texas Stadium, whose worn paint had become unsightly in the early 2000s, was repainted in the summer of 2006 by the city of Irving, the stadium's owners. It was the first time the famed roof was repainted since Texas Stadium opened. The roof was structurally independent from the stadium it covered. The stadium hosted neutral-site college football games and was the home field of the SMU Mustangs for eight seasons, from 1979 through 1986. After the school returned from an NCAA-imposed suspension in 1988, school officials moved games back to the school's on-campus Ownby Stadium to signify a clean start for the football program (since replaced by Gerald J. Ford Stadium in 2000). The 2001 Big 12 Football Championship Game was held at the site. The 1973 Pro Bowl was held at Texas Stadium in front of 47,879 spectators. In November and December, Texas Stadium was a major venue for high school football. It was not uncommon for there to be high school football tripleheaders at the stadium. Texas Stadium served as a temporary home for two Dallas-area high schools, Plano Senior High School in 1979 after its home stadium was damaged by a prank gone awry, and Highland Park High School while a new stadium on campus was being built. The stadium has also played host to the two largest capacity crowds for Texas high school football playoff games. In 1977, Plano defeated Port Neches-Groves 13-10 in front of a record crowd of 49,953. In 2006, the long-awaited mythical matchup between Trinity High School and Carroll Senior High School in the second round of the playoffs, ending in a scintillating 22-21 Southlake victory (on their way to a fourth 5A state championship in five years) before an announced crowd of 46,339 at Texas Stadium. The attendance appears to approach 60,000 midway through the third quarter, which would have set an all-time playoff record. These games marked two of the top three all-time attendance figures for a Texas high school football game and the stadium recorded three of the top twenty attendance records. In 1994, the stadium hosted the John Tyler vs. Plano East high school football regional playoff, whose wild seesaw finish won it the 1995 Showstopper of the Year ESPY Award. In addition to American football, the Dallas Tornado of the NASL used it as their home stadium from 1972 to 1975 and again from 1980 to 1981 when the team folded. On November 21, 1991, U.S. soccer team played a friendly match against Costa Rica. 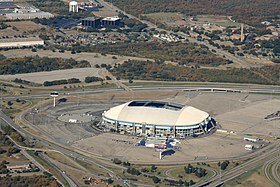 Texas Stadium hosted a round of the AMA Supercross Championship from 1975 to 1977 and 1983 to 2008. The Professional Bull Riders (PBR) held a Bud Light Cup event at Texas Stadium known as the "Battle of the Bulls" during the organization's first two years of existence (1994 & 1995). In both instances, the event was won by three-time PBR world champion Adriano Morães. The 1995 event was also notable because it rained while the roof was open, turning much of the dirt into mud, which affected the performance of several bulls. Metallica Faith No More Guns N' Roses/Metallica Stadium Tour 44,391 / 44,391 $1,220,753 Faith No More lead guitarist Jim Martin joined Metallica onstage for their cover of the Misfits song "Last Caress". September 24, 1993 Garth Brooks — The Garth Brooks World Tour — — The first show was recorded and broadcast on NBC, titled This is Garth Brooks, Too! (a follow-up to Brooks' 1992 televised concert). It was later included in Brooks' The Entertainer DVD collection, released in 2006. November 14, 1999 Shania Twain — Come On Over Tour 40,000 — This concert was filmed for a CBS TV special which aired on Thanksgiving night. System of a Down Summer Sanitarium Tour — — Metallica lead singer James Hetfield was unable to attend the concert as he hurt his back during a jet skiing accident while in Georgia before the Atlanta show. Metallica bassist Jason Newsted, along with other lead singers from the other bands on hand, sang most of the songs. Metallica did return in August to perform two make-up shows at the Starplex in Dallas a month later. The stadium hosted religious gatherings such as Promise Keepers and Billy Graham crusades; a Graham crusade was the first event held at Texas Stadium. From 1984 to 1988, the stadium hosted the annual World Class Championship Wrestling David Von Erich "Memorial Parade of Champions" professional wrestling card every May. The initial 1984 card drew more than 40,000 fans, the highest attendance of any wrestling card in the state of Texas at that time. From October 17 to October 20, 2002, evangelist Billy Graham held the Metroplex Mission crusade in Texas Stadium. Several Christian musical groups also played during the event. Former president George H. W. Bush gave an introduction for Graham on the first night of the crusade. The stadium appeared in numerous episodes of the television series, Walker, Texas Ranger (1993–2001), which was filmed in the Dallas-Fort Worth metroplex. Throughout the network run of the television series Dallas, a number of scenes were filmed on location at Texas Stadium. An overhead shot of the stadium (looking down at the field from the hole in the roof) was also featured prominently as part of the show's opening credits for each of its thirteen seasons on CBS. This trend has continued with the new series with AT&T Stadium taking its place. When opened, the stadium had many amenities that included 381 luxury suites, a stadium club where fans gathered for parties and banquets, and The Corral that provided food, beverages, entertainment and large screen televisions. However, by the 2000s other NFL teams received new stadiums that had more club and luxury seating than Texas Stadium had, so the Dallas Cowboys asked for a new stadium. The Cowboys left Texas Stadium after the 2008 NFL season for AT&T Stadium (opened for the 2009 NFL season) that was partially funded by taxpayers in Arlington, Texas. In November 2004, Arlington voters approved a half-cent (.005 per U.S. dollar) sales tax to fund $325 million of the then estimated $650 million stadium by a margin of 55%-45%. Jerry Jones, the Cowboys' owner, spent over $5 million backing the ballot measure, but also agreed to cover any cost overruns which as of 2006 had already raised the estimated cost of the project to $1 billion. AT&T Stadium, which has a retractable roof system, also includes a setting that mimics a hole in the roof as a tribute to Texas Stadium. The Cowboys lost their final game at Texas Stadium to the Baltimore Ravens, 33–24, on December 20, 2008. The stadium was scheduled for demolition and implosion on April 11, 2010, as confirmed by the mayor of Irving on September 23, 2009. The City of Irving announced that the Texas Department of Transportation would pay $15.4 million to lease the site for 10 years for use as a staging location for the State Highway 114/Loop 12 diamond interchange. The city has the right to relocate the staging area if redevelopment becomes available. On December 31, 2009, The City of Irving and Kraft Foods announced details of their sponsorship deal for the stadium's implosion — including a national essay contest with the winner getting to pull the trigger that finishes off the stadium. Kraft paid the city $75,000 and donated $75,000 worth of food to local food banks to promote its "Cheddar Explosion" version of Kraft Macaroni & Cheese. The city council unanimously approved the sponsorship deal. At 7:07 a.m. CDT on April 11, 2010, 11-year-old Casey Rogers turned the key to cause the demolition. From the first explosion, it took approximately 25 seconds for the stadium to completely fall. Debris removal continued until July 2010. Texas's Department of Transportation is using the site as an equipment storage and staging area, after which Irving will decide long-term plans. In 2013–15, the area around the former stadium has been the epicenter for at least 46 small earthquakes, ranging in magnitude from 1.6 to 3.6. ^ a b c "Dallas taps Pats for 44-21 win". Pittsburgh Post-Gazette. Associated Press. October 25, 1971. p. 35. ^ a b "Cowboys run over Patriots". Milwaukee Sentinel. UPI. October 25, 1971. p. 3, part 2. ^ Bell, Jarrett (September 18, 2009). "'This transcends football': 'Boys boast as new stadium shines". USA Today. ^ a b c Doelle, Chris. "Texas High School Football All-Time Highest Attendance". Lone Star Gridiron. Archived from the original on June 12, 2013. Retrieved June 5, 2013. ^ Doelle, Chris (December 19, 2008). "Carthage downs Celina 49-37 in last Texas Stadium high school game". Lone Star Gridiron. ^ Doelle, Chris (December 23, 2008). "122008 – BONUS Celina vs Carthage". Lone Star Gridiron. ^ Sandler, Adam (6 May 1994). "Review: 'This Is Garth Brooks, Too!'". Variety. Retrieved 10 March 2016. ^ Alfonso, Barry (2002). The Billboard guide to Contemporary Christian Music. New York: Billboard Books. p. 134. ISBN 978-0-8230-7718-2. ^ Ankeny, Jason. "Carman – Biography". Allmusic (Macrovision Corporation). Retrieved December 9, 2009. ^ Evans, Rob (11 October 1999). "Shania Twain Adds Cities To Her East Coast Tour". LiveDaily. Ticketmaster Entertainment, Inc. Archived from the original on 30 August 2003. Retrieved 24 March 2011. ^ Basham, David (2000-07-10). "UPDATE: Metallica Frontman Forced to Sit Out Shows". MTV.com. MTV Networks. Retrieved 2009-02-07. ^ "Cowboys, 49ers in Collision". Daytona Beach Morning Journal. January 1, 1972. ^ "1973 Dallas Cowboys Media Guide". Dallas Cowboys. Retrieved June 4, 2018. ^ "SMU-Arkansas Game a Sellout". Associated Press. November 15, 1982. ^ "Cowboys Buying Ads to Sell More Tickets". The Victoria Advocate. June 27, 1988. ^ "Cowboys Are in Demand". Altus Times. September 20, 1992. 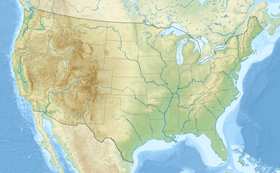 ^ "City Officials Vow to Bring Super Bowl to Irving, Texas". Kingman Daily Miner. February 8, 1996. ^ "Sports Line". The Bonham Daily Favorite. June 23, 1999. ^ "2001 Dallas Cowboys Media Guide". Dallas Cowboys. 2001. Retrieved June 8, 2018. ^ "2003 Dallas Cowboys Media Guide". Dallas Cowboys. 2003. Retrieved June 8, 2018. ^ "Texas Stadium Transition Under Way" (Press release). City of Irving, Texas. 2010-02-16. Archived from the original on 2010-05-28. Retrieved 2010-04-11. ^ Dallas Morning News: What's next after demolition? Wikimedia Commons has media related to Texas Stadium. Sarnoff, Nancy. "In Irving, stadium implosion=development opportunity." Houston Chronicle. April 19, 2010.
crossroadsdfw.com shows potential redevelopment plans for the stadium after the Cowboys leave.